For the first time in Australian history the Federal Government has legislated that its primary commitment is to the non-government sector, Federation President Maurie Mulheron said today. “This is an important message that we will be taking not only to targeted seats like Page, Robertson, Banks, or Gilmore on the South Coast, but we will be taking this message to our school communities right across NSW in the next weeks and months leading up to the federal election,” he said at the launch of the next phase of the Fair Funding Now! campaign. 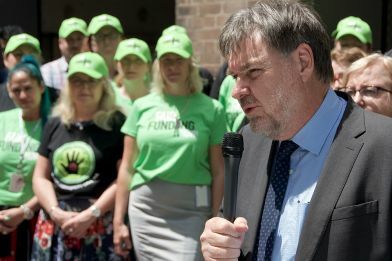 Mr Mulheron unveiled distinctive green vans and cars that will have a highly visible presence in communities around NSW during the campaign to inform students, principals, parents and teachers of the raw deal the federal Coalition Government has proposed for public education. Mr Mulheron told viewers during the launch, which was live-streamed on the Fair Funding Now! Facebook page, the Morrison Government had turned its back on students in public schools by cutting $14 billion in projected funding over the next 10 years. “That means that 99 per cent of public schools will not be reaching the minimum Schooling Resource Standard,” he said. “At the same time they’ve launched a $4.6 billion slush fund for private schools, of which not one single dollar goes to public schools. “So in essence, all public schools will be under-resourced and not reach the Schooling Resource Standard, and most private schools will be over-resourced. “This is due to an artificial cap the Government has imposed on its funding model, where the national government will only provide 20 per cent of funding to public schools to meet the Schooling Resource Standard but they’re prepared to fund non-government schools up to 80 per cent. Mr Mulheron said Labor, in contrast, has guaranteed it will return the $14 billion back to the public education system. “For NSW, that would mean almost an additional $1 billion for NSW public schools if the Morrison Government is defeated at the federal election,” he said.